This year's St. Patrick's Day is one of the first I'll be able to celebrate properly since it's on a weekend and I have no other responsibilities looming at the moment. My good friend Bree (who let me do her nails a few months ago when I was first starting out) also wanted to take advantage of this and asked me to do her nails. Of course I said yes! Her ideas were amazing too, and this is the result. Obviously this took a mother load of polishes to create. I used Starboard (China Glaze) as the gorgeous Kelly green base. We thought about topping it with some Kleancolor chunky holos, but it was too stunning on its own. Her ring finger's base is Glitter in my Stocking (Nicole by OPI). That's also the gold in the pot of gold. 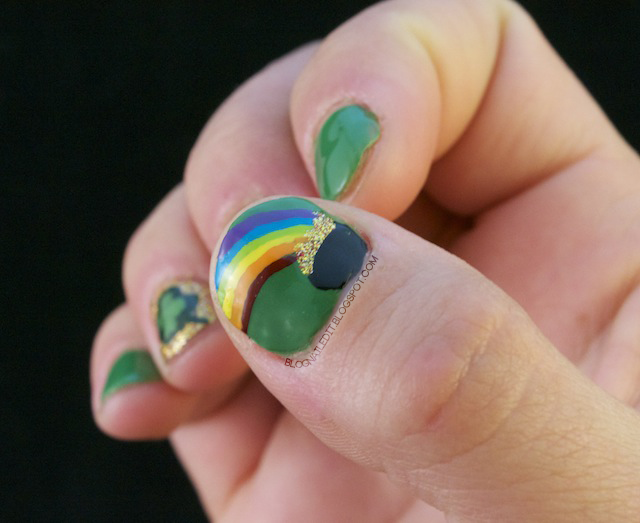 The pot (done with Time Off by Sinful Colors) is only on one of her thumbs, and the other thumb is a continuation of the rainbow. The colors used for the rainbow include Be My Valentine (Sinful Colors), Papaya Punch and Happy Go Lucky (China Glaze), Lickety-Split Lime and Brisk Blue (Sally Hansen Insta-Dri), and I'm a Belieber (Nicole by OPI). This was my first try at my new MASH brushes, and I absolutely love the little one that comes in the set. I'm sure it'll wear out fast. I have big plans for that little guy. 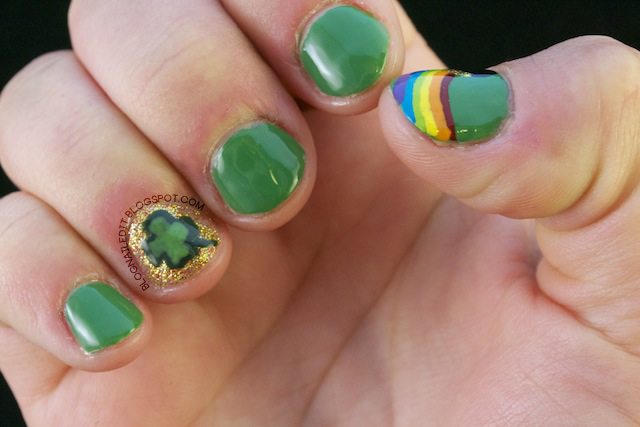 Her ring finger was done freehand, using Artsy Crafty (Color Club) and Limelight (Ulta). She was absolutely tickled by the time I finished (even though it took quite some time), and we celebrated at The Sink and a Hookah bar I've never been to. She said she even got a compliment on her nails going into the bathroom.